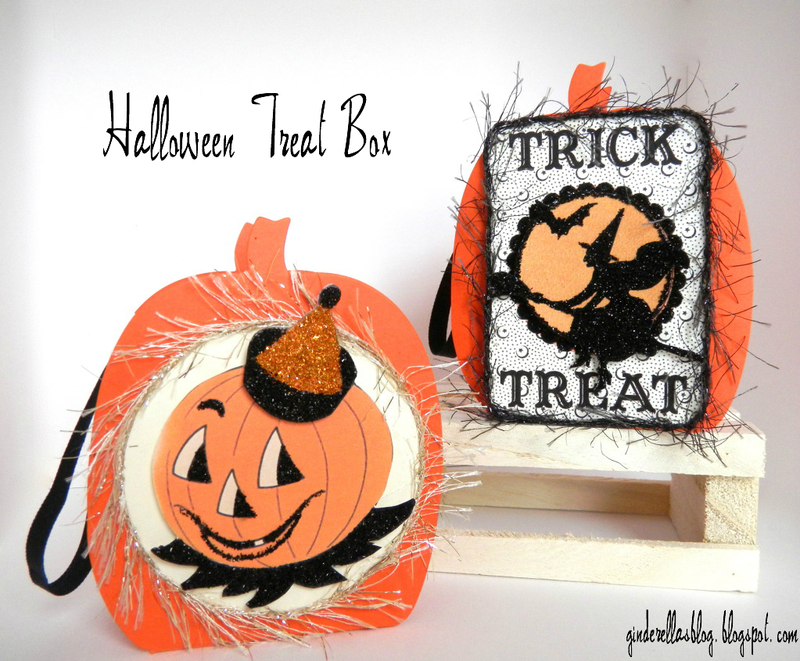 Last year I had bought these pumpkin treat boxes after Halloween on clearance. I decided I should probably make something with them so it wouldn't be another one of those impulse clearance buys. I also have some skeleton heads I bought too, but thats another day! These are the links to the clip art I used Pumpkin and I use two different ones from the Graphics Fairy and layered them. They are Trick or Treat and Witch. On the Pumpkin clipart I drew a collar on it, I just thought it needed something else. I added my orange and black glass glitter. I cut out the witch, stuck some foam tape under it and put it over the owl that was one the trick or treat clipart. Glueing the glitter eyelash yarn around the edges I found was a little tricky just have to be careful not to get glue on the eyelash part. I think I had more glue on my fingers than the glitter eyelash yarn. I just need to get some treats for inside the box! How cute! Love the yarn--what a great addition to the projects to give them some sparkle! Oh my goodness! Over-the-top cuteness!!!! Thanks so much for sharing your talents at the Tuesday To Do Party! These are sooo stinking adorable.. I just love the little witchy one! So adorable! My kids would love to get one of these bags filled with treats! Thanks for linking at printabelle. Very cute! I would love a glittery bag of candy! Beautiful!!! I love papercrafting and you've done an amazing job on these! I love Vintage Halloween! Thank you for adding your creation to our blog party. Don't forget to follow us and add our blog party button to your post! So cute! Love the vintage feel of these! Thanks for sharing at the Pomp Party! You sure know how to cute something up!! Nice project! super cute, will have to try it!!! thanks for the inspiration!!! You been featured from last week's Blog Party! Congratulations! Come grab your feature button in this post! See you there! Hope you will link up your new creations in this weeks party again! We can't wait to see what you share in the new linky starting Friday night midnight! We also invited you to our exclusive Pinterest Feature Friday Board. You can pin anything fun & crafty!